Happy 4th, eat well in the land of the free! After almost twenty years living and working in this wonderful land we now call home, it is our honor to celebrate the birth of America every 4th of July. We just love the tradition of this holiday with families gathering together to eat, laugh, love have fun with fireworks. The red, white and blue is alive and well, and to honor this day I have created a patriotic dessert for everyone to enjoy while we wait on the pyrotechnics! Preheat the oven to 350 degrees F. Line and grease a baking sheet with parchment wax paper. In electric mixer beat egg whites at room temperature. Slowly incorporate sugar one teaspoon at a time. Blend in the cornstarch and wine vinegar and vanilla. Spread meringue in a circular fashion on lined baking sheet, building up the edges a little higher than the middle. 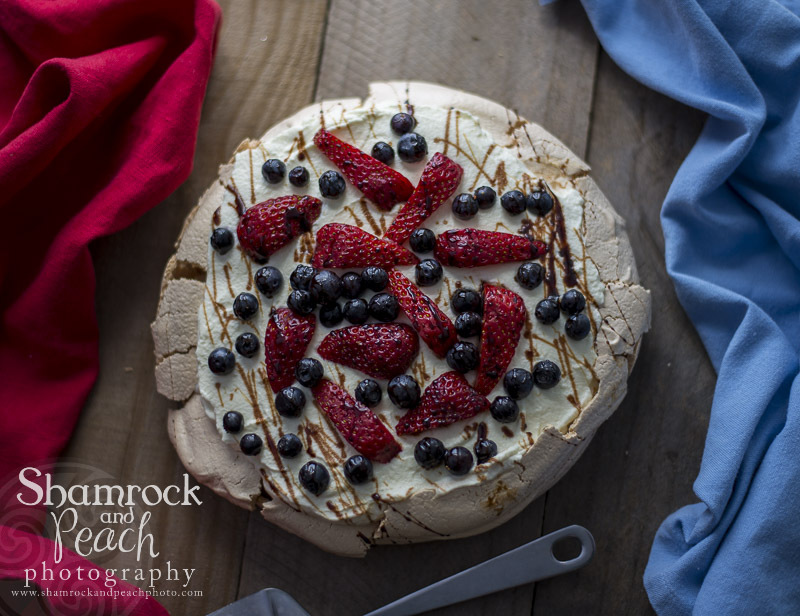 Place Pavlova in the oven and reduce temperature to 300 degrees F. Bake for 1 ¼ hours and then switch off the oven allowing the Pavlova to dry out for another hour so that it becomes crunchier on the outside but still has a lovely soft center. Whip fresh cream, vanilla and sugar to soft peaks appear. To assemble the Pavlova spoon the top with fresh cream. And then garnish with the seasonal berries. Drizzle with reduced balsamic.